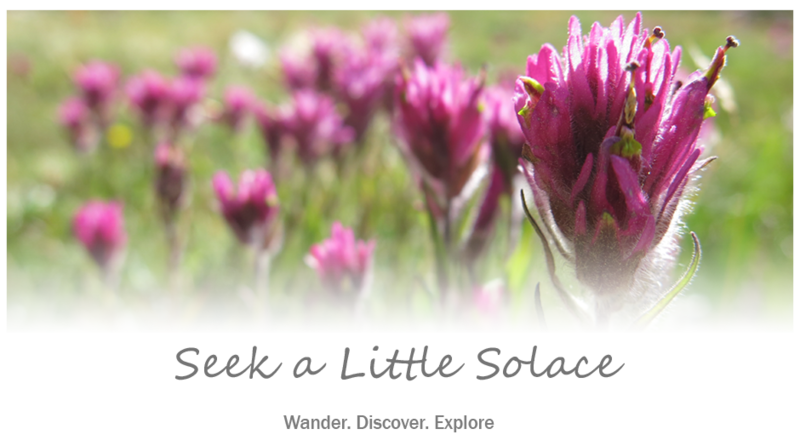 After our lovely Labor Day backpacking trip last week, I decided to stay at home to rest my aching joints and tend the to-do list this weekend while my hubby headed out for a solo Sierra adventure. Anticipating a big day in the great outdoors, he kindly requested a burger for dinner. A homemade one…with hormone-free, grass-fed beef…on a gluten-free bun…and fresh hand-cut potato fries on the side…and a gluten-free beer? Pretty pleeeease? Well, how could I say no to that. Of course I will make you a burger and fries. Oooohhh…with fresh herb and garlic salt on my fries? Okay, buddy, now you’re pushing it. I agreed to the burger and fries, but drew the line at the fancy garlic salt. However, as the day drew on and I shopped and prepped for my hungry hiker, I found myself chopping fresh herbs, pressing garlic and making that darn salt. Sometimes all it takes is a little bit of fancy salt to make someone smile. And I must admit, I do love making my special someone smile. Of course, I must admit to my own selfish motives. If there is one guilty pleasure I am happy to indulge, it is my love of fries. Forget the burger and just give me a big plate of hot fries! Not just potato fries, but carrots, parsnips, sweet potatoes, beets…I just adore crispy, salty, fried root veggies of any kind. 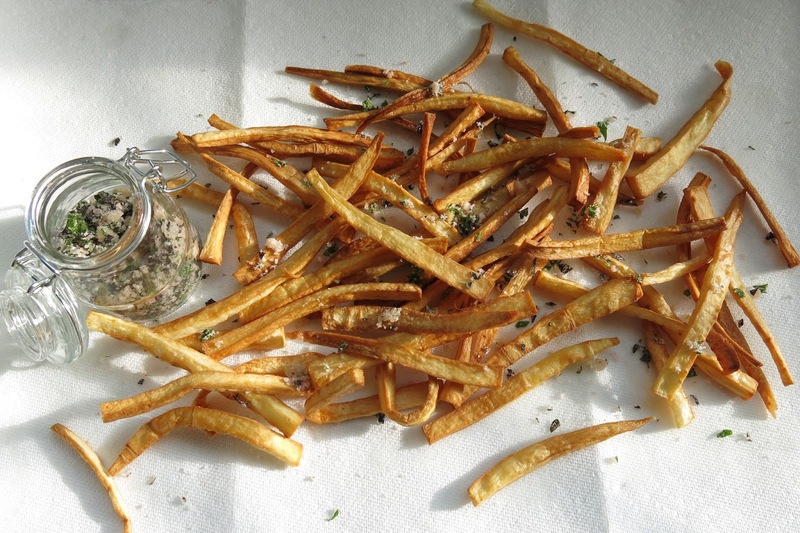 I had some parsnips and herbs in the fridge that needed to be used and I’ve been wanting to try these parsnip fries for a while now, so I whipped up some of this fresh herb and garlic salt and made myself a big ‘ole plate of fancy fries. Now that I think about it, I didn’t actually follow the original recipe at all, but I did get my inspiration from Sarah over at A house in the Hills. 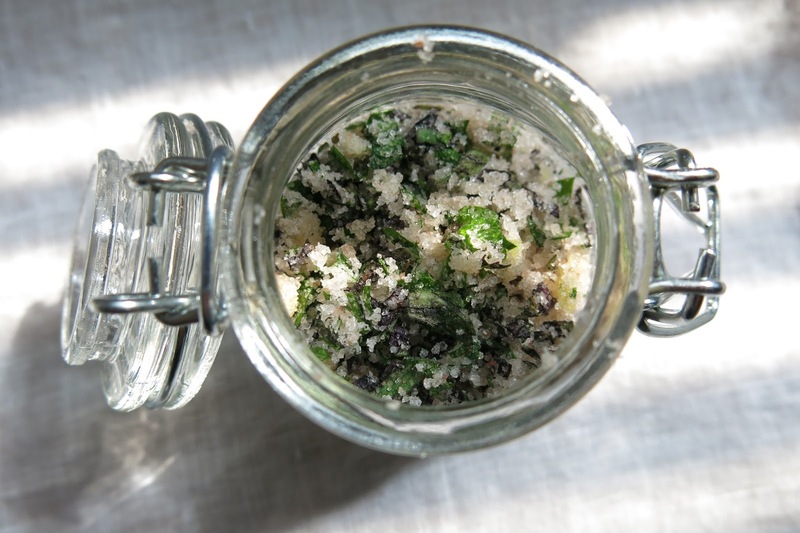 I started by making my herbed salt, which is really quite simple and a little bit goes a long way. I poured about 1/4 cup of sea salt in a small bowl. 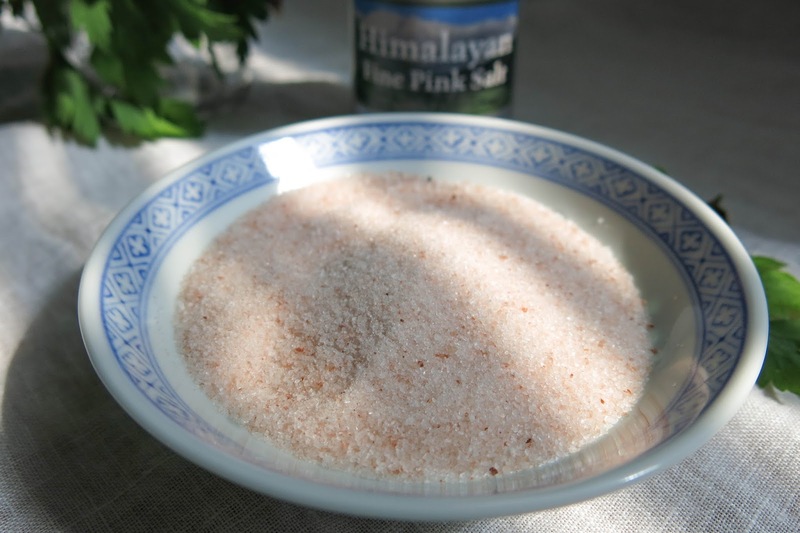 I like to use this Himalayan pink salt which I can usually find at our local grocery store. 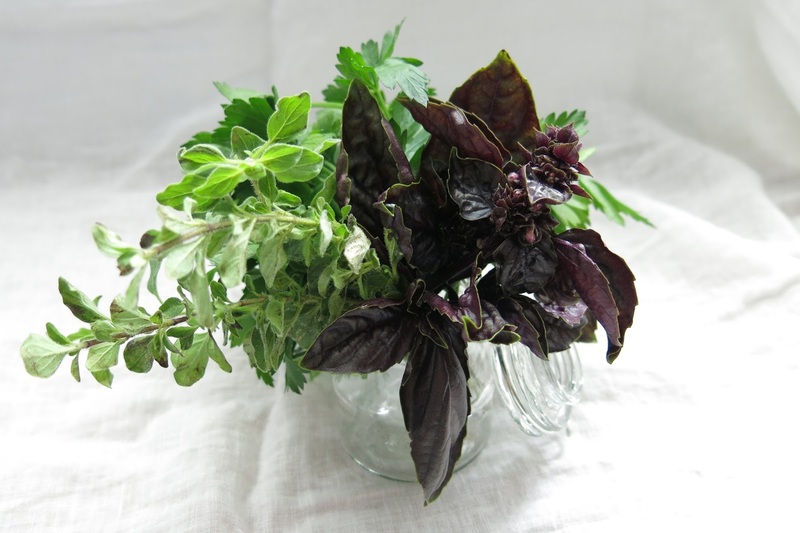 Then, I crushed a clove or two of garlic, chopped a handful of various fresh herbs (I used purple Thai basil, oregano and parsley because that’s what I had on hand) and incorporated them into the salt. Like I said, a little goes a long way with this flavorful salt. 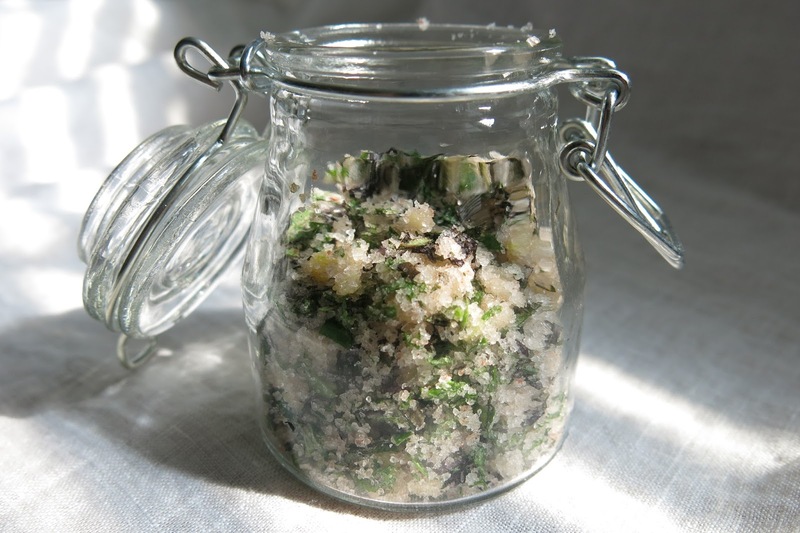 A small jar can be stored in the fridge for a week or so and you can use it to fancy up just about anything. I like to use it on salads, sautéed kale, roasted veggies, eggs or toast. 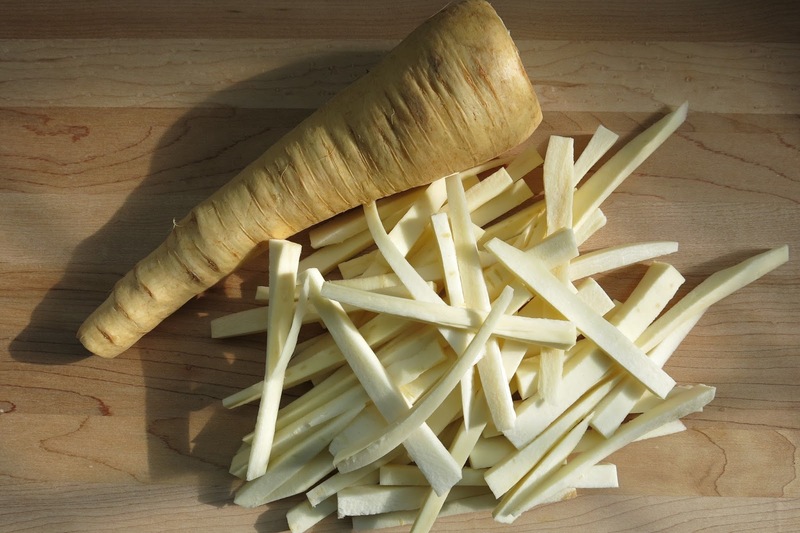 Next up, I cut the parsnips into fry-size strips. Now, a healthier choice would be to bake them in the oven, but I fried mine up in a big pot of hot oil on the stove. When they were crispy and golden brown, I removed the parsnips from the oil and spread them out on a baking sheet covered with a paper towel. I immediately sprinkled the hot fries with a little pinch of my fancy salt, transferred them to a plate and enjoyed them with a tasty dipping sauce. I love the flavor of smoked paprika with root vegetables. 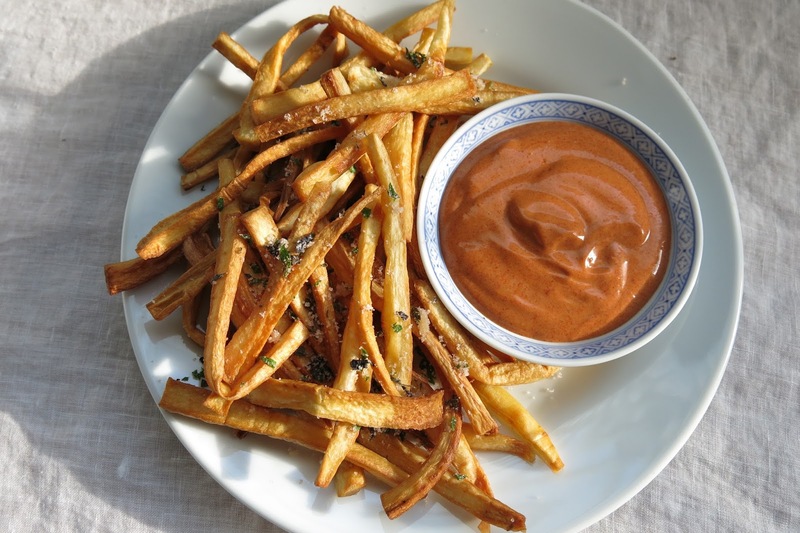 Usually, I sprinkle it on top of my fries, but this time I decided to make a quick and dirty dipping sauce by mixing together 3 tablespoons Vegenaise (or regular mayo), 1 teaspoon ketchup and 1/2 teaspoon smoked paprika. I so enjoyed indulging in this smokey, garlicky, herby, salty, greasy, guilty pleasure while I waited for my hungry hiker to return from a long day in the great outdoors. I made his fries out of potatoes and served them up alongside a homemade burger. It was worth going the extra mile to see him smile at the sight of that fancy salt. This morning, the hungry hiker requested fried eggs with a potato hash side dish. That boy always has a monster appetite after a satisfying Sierra trip and I was happy to cook him up some grub. 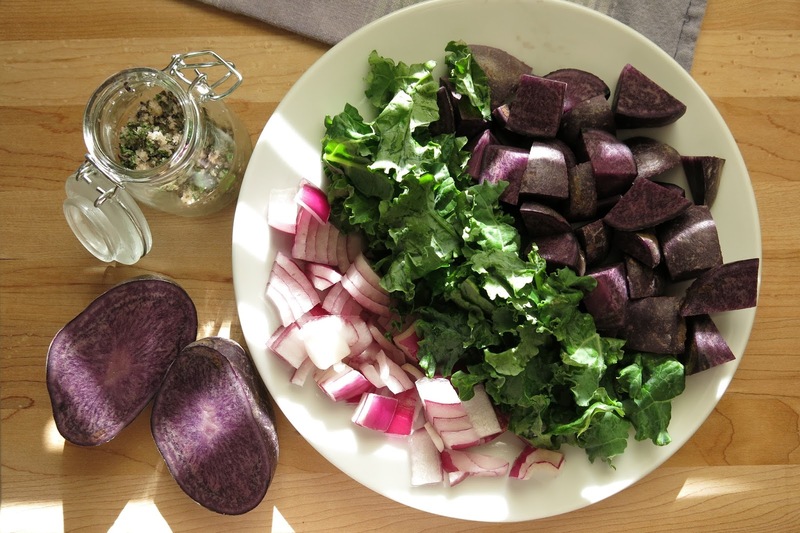 I thought I should make good use of that herbed garlic salt and in a what-to-do-with-this moment, I decided to use the purple potatoes from my CSA box. 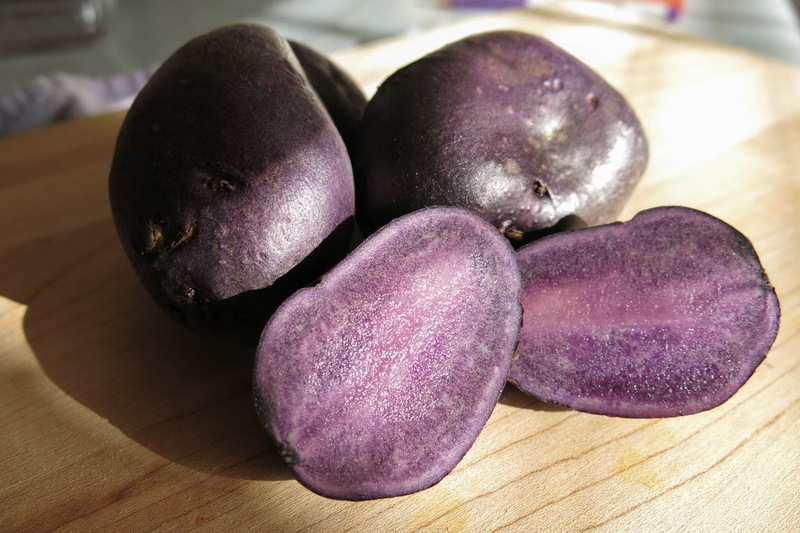 I am quite sure he was expecting plain old potatoes, but I just couldn’t resist using the fancy purple ones. There is something about those vibrant varieties of fruits and vegetables that I find so enchanting. Slicing into those purple potatoes gave me a silly little satisfaction and brought a bit of color to my day. 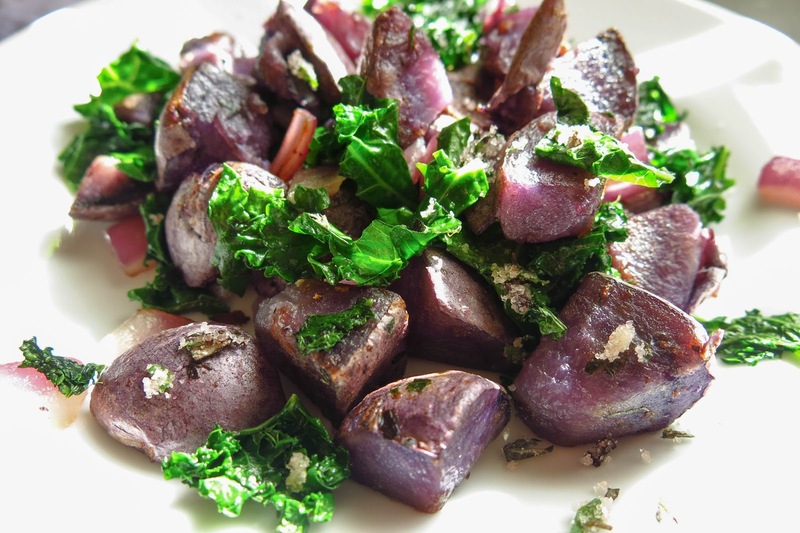 I tossed them in a pan with a little coconut oil, some diced red onion and deep green kale. I pan roasted them until they were soft on the inside, a little crispy on the outside and then I sprinkled them with just a pinch of herbed garlic salt. Mmmm. Sometimes it’s the littlest things in life, like a plate of parsnips or purple potatoes, that bring the most delight.